Back, from left, Mollie Gotham, Amanda Perkins, owner Aaron Jolly, Desiree Hanley and Kim Shofkom. Middle, wan Wilkins, Wyatt Mowers, Emma Hurlbut and Kaiden Donaldson. Back, Patience Martin, Arianna Judware, Bralynne Dox-Clement, Brian Brooks, Terry LaPrade, Grayson Leigon, Daphne Zender, Hanna Brooks and Terrianna Kerr. 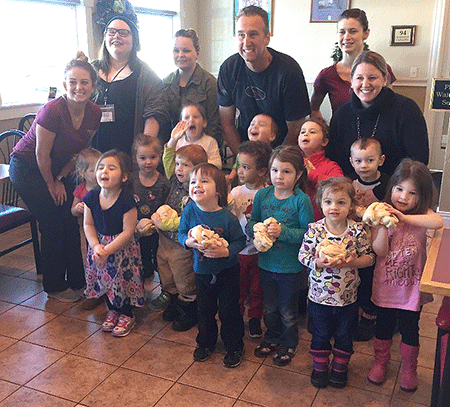 MASSENA -- Massena Home Based Head Start recently took a field trip to Italian Affair. Children were shown how pizza is made and were able to make their own pizza. Head Start is accepting applications for 2018-2019 school year. Call 315-386-8574 to apply.